Rizzle-Razzle is so stinkin’ cute! (Can’t decide between the names Rizzle and Razzle, so there you go). 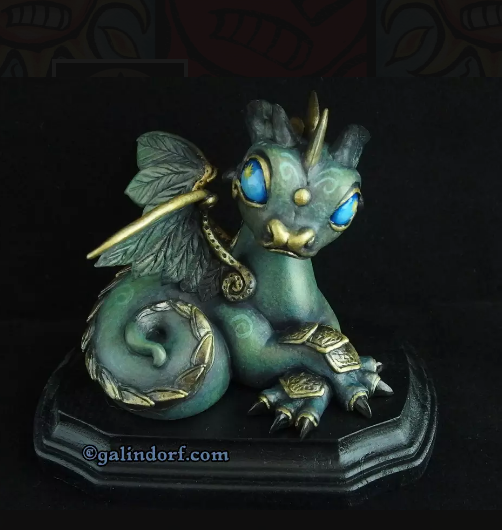 I commissioned this little baby from the wildly talented Galindorf last year and just received word that he is complete. I am now the proud foster mommy of an earth dragon. Go get yours. Galindorf does custom work! I suppose you’re wondering where I’m going with this post. Me, too. I don’t normally do plugs on my blog, but this is a special occasion. What do we know of the elusive Muse? Within the writing circle, we artistics can get creative and playful with our craft. You may hear authors say, laughingly, that their characters “talk” to them, or maybe a story will “run away from them”. If we’re going to give so much imaginative freedom to writing, we might as well embody inspiration as well. A Muse can be a physical or ethereal being which comes and goes at random. This explains why inspiration will strike wildly out of nowhere, but leave us empty for long periods of time. Depending on your levels of inspiration, your Muse might be described as “flighty”, “mischievous”, or “energetic”. Think about your own inspiration. See if you can imagine a creature that might visit you to bestow such gracious creativity to your writing. Then in the comments below, describe your Muse, name it, and introduce it to the world. Oh, and let’s have some fun. Keeping things light and fun. 😉 Post when you do!